What is top of mind for us Brits? What is the most popular pub name in the UK? Then it was a case of simply inserting it as a document into MongoDB. I quickly noticed that the data needed a little cleaning, as I was seeing duplicate pub names, for example: “The Red Lion” and “Red Lion”. 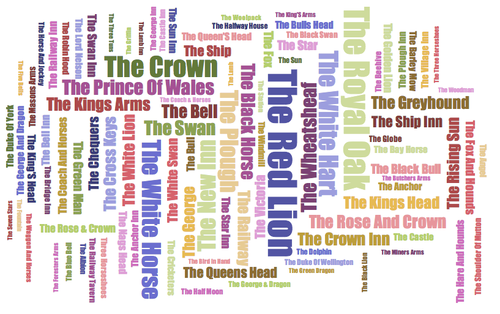 Because I wanted to make a wordle I normalised all the pub names. What about where I live? At the conference I looked the most popular pub name near the conference. Thats great if you happen to live in the centre of London but what about everyone else in the UK? So for this blog post I decided to update the demo code and make it dynamic based on where you live. Apologies for those outside the UK - the demo app doesn’t have data for the whole world - its surely possible to do. All the code is available in my repo on github including the bson file of the pubs and the wordle code - so fork it and start playing with MongoDB’s great geo features!